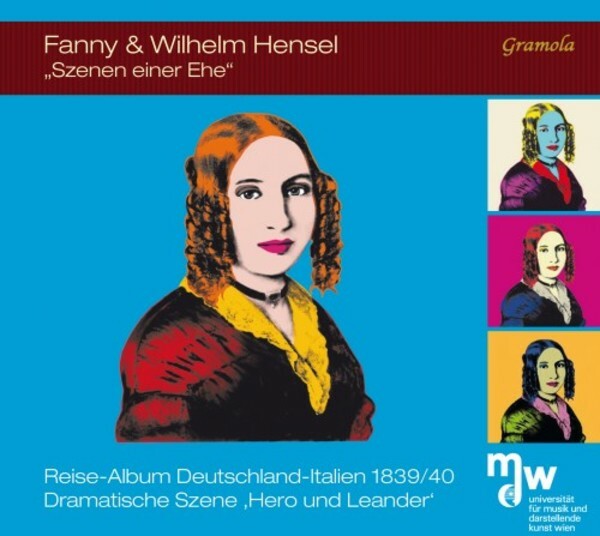 This CD production emerged out of the project “Room for Fanny Hensel” at the University of Music and Performing Arts, Vienna (mdw), presenting and promoting rarely received works by Fanny Hensel (aka Fanny Mendelssohn) as well as the artistic collaboration with her husband Wilhelm Hensel. The composition of their “Travel Album” bears witness that music, painting and poetry had been integral components of their lives: Fanny, sibling of Felix Mendelssohn-Bartholdy, wrote the work on paper of varying colour, while Wilhelm Hensel decorated the beginning of every composition with vignettes, putting the musical characterizations into perspective to the months and adventures of their journey to Italy in 1839/40. The earlier “dramatic scene for soprano and piano” Hero and Leander exhibits the artistic ties of the couple on a different level: Fanny Hensel setting the verse of her husband to music. This recording features music students from four different departments of mdw. The accompanying booklet is lavishly illustrated with Wilhelm Hensel's original vignettes.